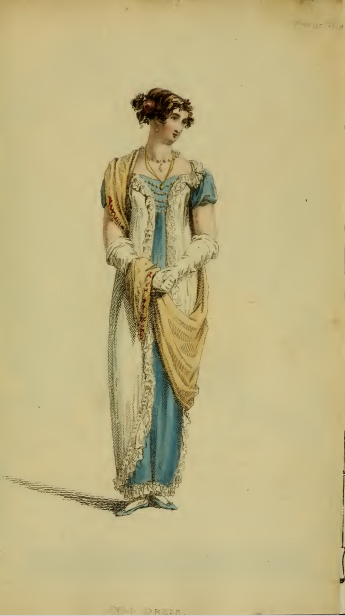 With the line of Regency gowns so straight and plain, dressmakers had to look to other parts of a dress for places to exert their creativity. One such part was a dress’s sleeves. 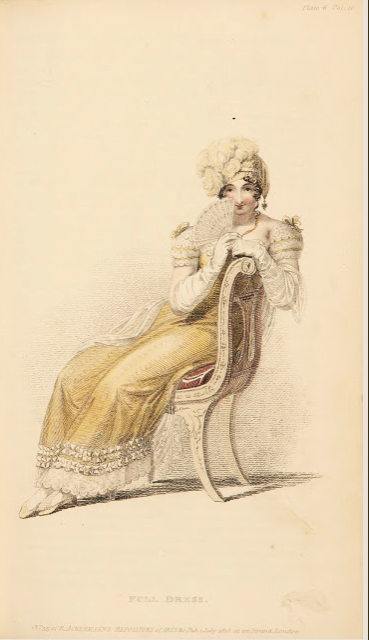 While some Regency gowns boast sleeves as straight as their skirts, many feature sleeves with gentle or gigantic puffs. Still others display intricacies that would look overly fussy on a dress with a more curved or intricate line. Take for instance the sleeves on Plate 6: “short sleeves composed of the shell-scalloped lace and satin, decorated with bows on the shoulders, and formed so as to display perhaps rather too much of the bosom, back, and shoulders.” The sleeves look to me like tiny iced cupcakes, good enough to eat—which is perhaps why the writer felt called to add that cautionary note about the sleeves’ cut. All too easy to move from nibbling on a sleeve to nibbling on a bosom, back, or shoulder, no? 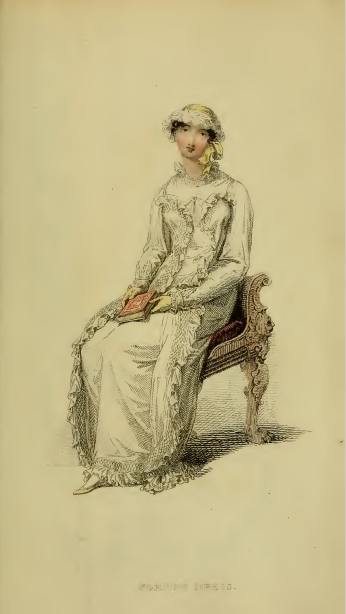 Have you seen other examples of intricate Regency dress sleeves? 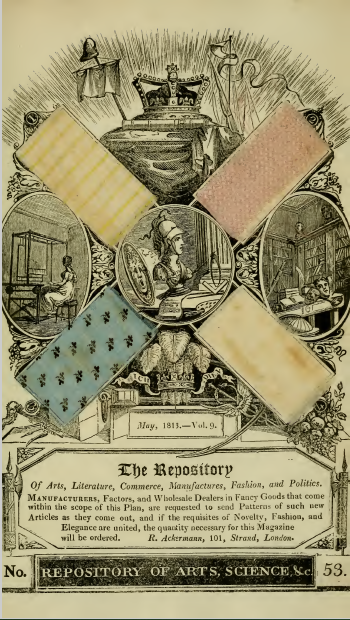 This month’s issue features another “Letter from a Young Lady in London to Her Friend in the Country,” filled with fashion advice (which I will reprint in next week’s blog). Arbiter Elegantarium, who once delivered detailed advice via the fashion plates, seems to have been replaced by this new occasional feature. 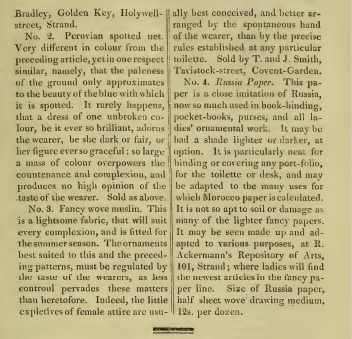 But perhaps AE has taken refuge in writing the fabric sample descriptions? 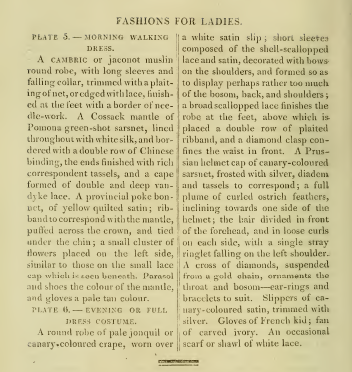 Very different from the descriptions in past issues, July’s notes include digressions about choosing a dress color to match one’s complexion and the exhortation to avoid wearing a dress made of fabric of all one color: “It rarely happens, that a dress of one unbroken color, be it ever so brilliant, adorns the wearer, be she dark or fair, or her figure ever so graceful: so large a mass of color overpowers the countenance and complexion, and produces no high opinion of the taste of the wearer.” Do you agree with this opinion? The writer of the descriptions and the worker who colored the plates for June 1813’s issue seem not to have been on the same page. 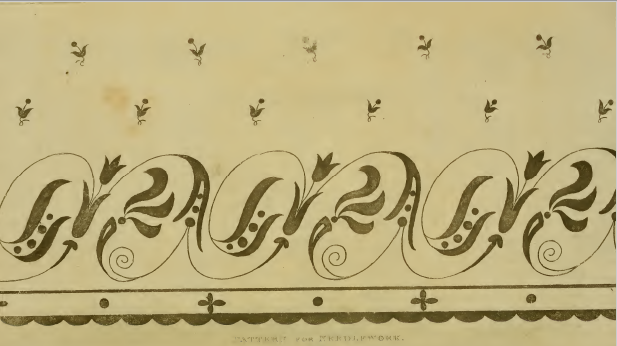 The satin “Pomeranian mantle” of plate 45 is described as “jonquille,” a color Regency researchers say is a yellow, similar to that of a spring Narcissus (or jonquil). But the mantle in the plate appears to be light blue. 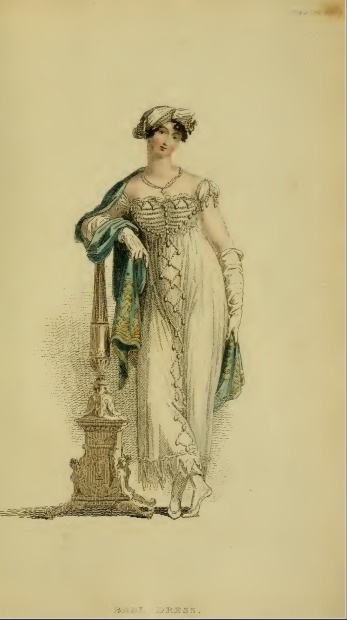 Plate 46’s “Ball Dress” appears white in the plate, but is reported to be “lilac or apple-blossom” in the description. 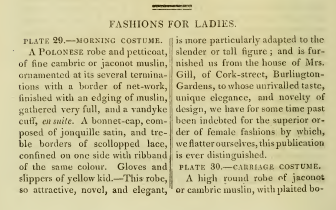 And the scarf worn over it appears to be a blueish-green, while the copy describes it as “Lemon-coloured or white… with rich embroidered ends of gold and coloured silks.” I wonder how often the writer and the person hired to hand-color a fashion plate got their wires crossed? Whether the underlying dress is white, lilac,or apple-blossom, the beadwork and hem trimming on this ball gown is making me drool: “white beads and drops, à la militaire” and “a deep vandyke trimming of lace, or lilac Angola silk, round the bottom of the robe.” I don’t know if my needlework and beading skills would be up to the task, but I find myself itching to attempt to reproduce these fantastic adornments. This may be one of my favorite plates in all of Ackermann’s to date. 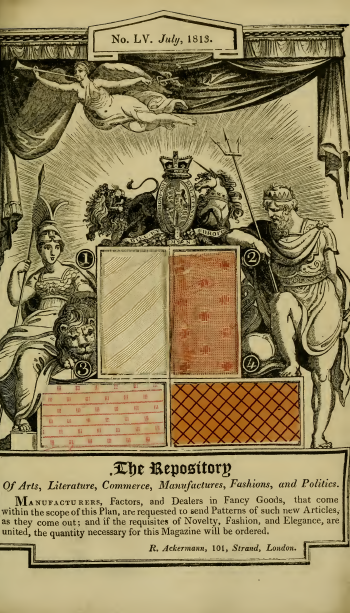 June’s fabric samples seem to designed to puff two particular warehouses. First, “Allen’s celebrated furniture warehouse” in Pall Mall, which has “recently built and spend a most spacious and elegant saloon, where, by a very ingenious invention, the printed and cotton furniture is displayed at one view, to the greatest advantage, and so as to afford an easy decision as to effect.” I wonder what that “ingenious invention” might have been? 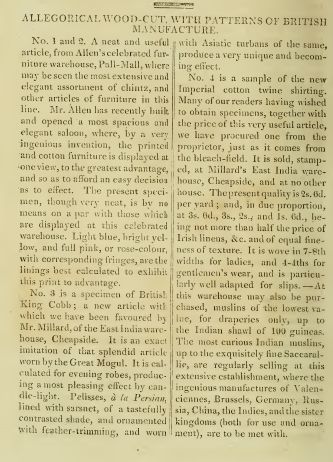 Second is Mr. Millard’s East India warehouse in Cheapside, which is advertised as having “Imperial cotton twine shirting” that can be found at no other house, as well as a wide variety of muslins, from “the lowest value, for draperies only, up to the Indian shawl of 100 guineas.” Did Mr. Ackermann get a cut of Mr. Millard or Mr. Allen’s profits, if their customers mentioned where they had heard of them, I wonder? Anyone have any idea of what “British King Cobb” might be? 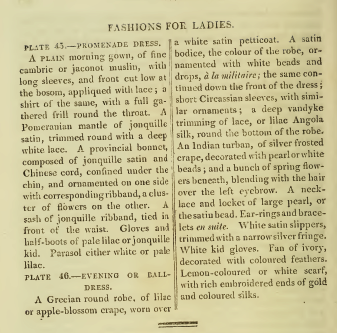 Such a name is given to sample #3, the pattern on which is described as “an imitation of that splendid article worn by the Great Mogul.” I find it rather ugly, myself, but perhaps the fashion for Oriental garb made it acceptable to 1813’s fashionables? 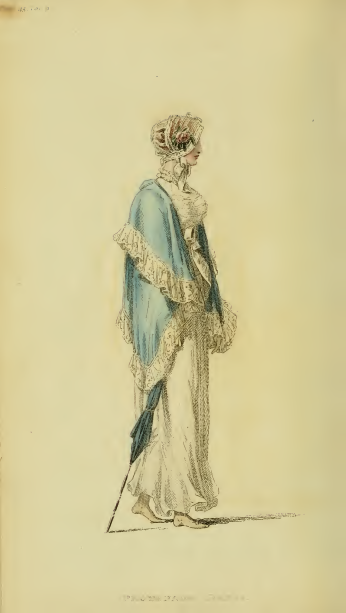 What catches my eye in May 1813’s fashion plates are the accessories, at least in Plate 37’s “Evening Dress.” Over the celestial blue satin slip lies not only a “polonaise long robe of white crape, or gossamer net, trim entirely round with lack and knotted beading,” but also a “Grecian scarf, a pale buff color, embroidered with shaded morone silks in Grecian characters.” One cannot make them out from this plate, but I do wonder just what “characters” the embroiderer chose to feature—Greek letters? Figures similar to those found on ancient Greek pottery? The novel I am currently working on features some rather racy Greek poetry in translation; can you imagine a bluestocking embroidering something similarly scandalous on her scarf? The wearer of the Evening Dress also wears “a double neck-chain and heart of Oriental gold, inclosing an amulet.” Is there something special about “Oriental” gold? And what kind of amulet does that heart of gold “inclose”? Lots of potential for secret messages and codes here, don’t you think? 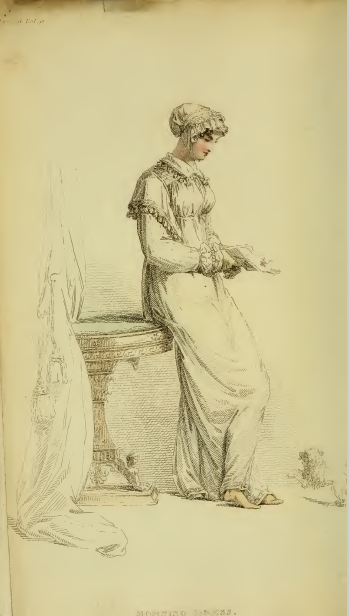 I think the most amusing adornment this month is in Plate 36—the very tiny dog rushing in from the right-hand side of the page, eager to greet its mistress. Do you think she will be able to set down her book and scoop it up before it jumps all over her clean white gown? 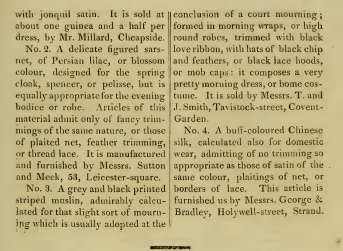 This month’s fabric samples are all intended for domestic or morning wear, including a “Smolensko striped imperial washing silk.” Was said silk imported from Smolensk, one of the cities that Napoleon had invaded during his ill-fated invasion of Russia a year earlier? Purchasing such a product would be a sign of patriotism, would it not? 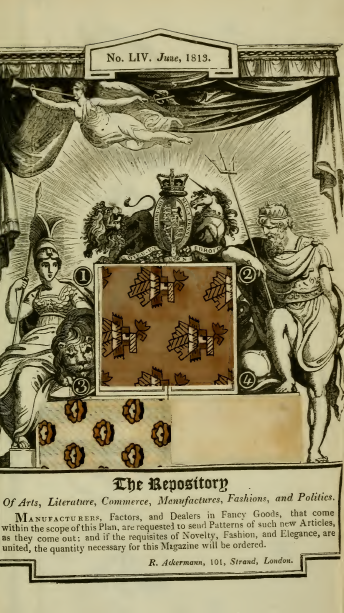 The issue also includes another striking needlework pattern. 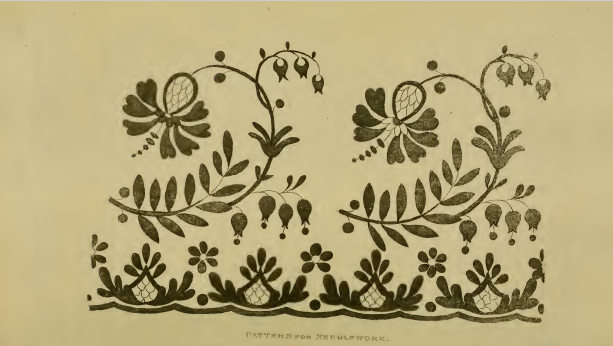 I’m a needlepoint gal myself, but these patterns look like they might be for either embroidery or crewl work. 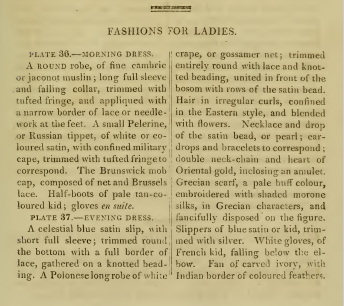 In Regency romances, we often read of characters perusing fashion plates to choose patterns for their own dresses. 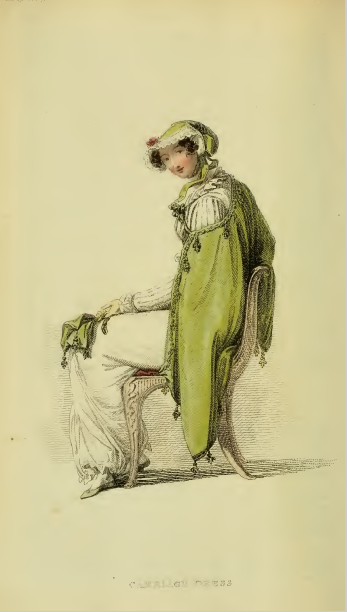 But in looking at Ackermann’s April 1813 plates, I’m struck by the fact that such plates are often drawn in a way that would make it difficult, if not impossible, for it to be used as a precise model for an actual dress pattern. Plate 29, of a “Morning Costume,” is shown full on front, but Plate 30, for a “Carriage Costume,” is a side view, and with its lady seated. The long Russian mantle worn over the “high round robe of jaconet or cambric muslin” covers all of the details of the dress’s bodice and sleeves. 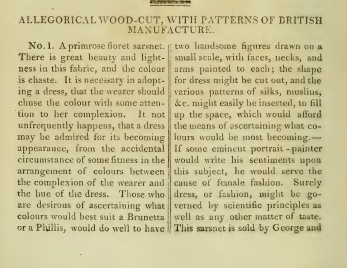 Would a viewer know enough from the description—”with plaited bodice, long sleeve, and deep falling frill, terminated with a vandyke of needlework”—to be able to faithfully reproduce this dress? Or was the idea less about providing instructions for making a perfect copy, and more about giving readers (and dressmakers?) a more general sense of what was currently deemed fashionable? 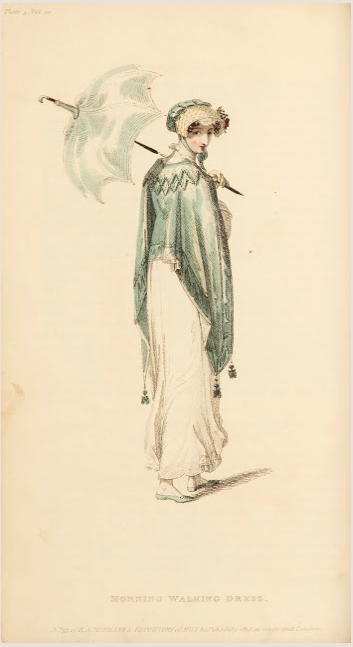 Plate 30 does provide a luscious example of a distinctly Regency color: “pomona or spring green.” Doesn’t it make you eager to throw off the chills of winter and hunt for the green points of spring bulbs poking through last fall’s leaves? This month’s issue includes no fabric samples, but instead this lovely pattern for needlework. 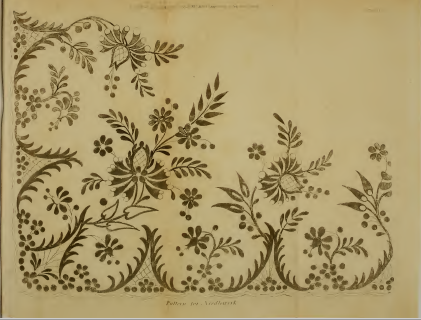 Can you imagine spending a rainy spring afternoon adding this pattern to the hem of a gown?